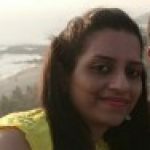 What is happening in the 3rd week of pregnancy? 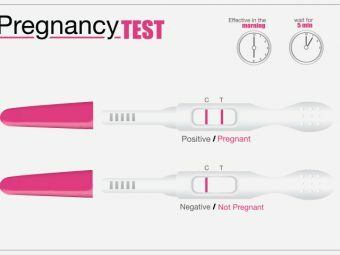 Can you get a positive pregnancy test result in this week? What symptoms do you experience in the 3rd week of pregnancy? 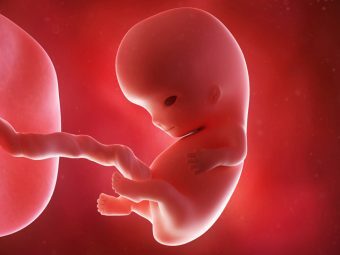 The third week of pregnancy is a crucial period for your baby’s development, but you might not even know that you are pregnant until you miss your periods a week later. 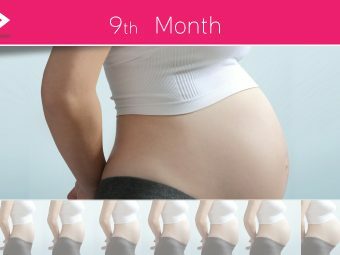 In this article, Momjunction explains what is happening inside you in the third week of pregnancy and how you can take care of yourself and the baby during this vulnerable time. During the third week, the fertilized egg starts moving in the Fallopian tube, making its way to the uterus. The fimbriae (small finger-like projections in the Fallopian tube) help in sweeping the fertilized egg through the Fallopian tube and into the uterus. 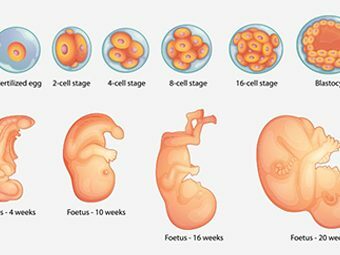 In the meantime, the fertilized egg first splits into two cells, and three days later it splits into 16 identical cells. This cell division forms a complex ball of a fluid-filled cell structure called blastocyst that eventually implants itself into the uterine walls. The blastocyst is also known as the zygote (1). The blastocyst is burrowed in the uterine wall and starts stretching, while the outer layer begins forming the placenta that supplies oxygen and nutrients to the embryo. The inner layer forms the baby, and the fluid-filled part turns into the amniotic sac that protects and cushions the baby throughout the pregnancy. After the implantation, the hCG hormone is released into the blood, signaling the brain to stop the production of any further ovum. The production of the pregnancy hormones estrogen and progesterone also increases at this time. If you’ve been planning to get pregnant and take a pregnancy test at this time, the results might not be accurate. Can You Get A Positive Pregnancy Test this Week? The level of hCG hormone may not be detectable at this week (2). You will need to wait for one more week to confirm the pregnancy using a home pregnancy kit. However, high sensitive pregnancy kits claim to detect the hCG level from the second week of pregnancy. Even a blood sample drawn at this week can detect only a small amount of hCG hormone. However, you may try to look for symptoms of pregnancy at this stage. 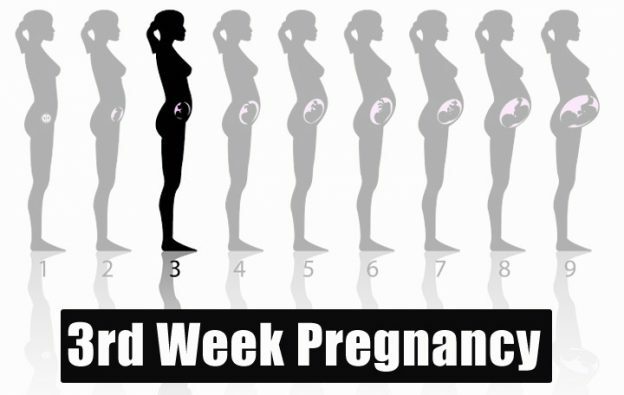 What Are The Symptoms You Experience In The Third Week Of Pregnancy? When the fertilized egg gets implanted in the uterine wall, the hormonal levels in the body change, leading to physiological changes (3). Mild cramps: A change in hormonal levels causes cramps, also indicating implantation. Spotting/ implantation bleeding: A red or pink discharge indicates the implantation of the zygote. Nausea: The hormonal fluctuations can make you feel nauseated. Fatigue: The hormonal fluctuations and the extra work happening inside the body makes you feel tired. Tender breasts: The breasts may feel fuller and sore. Food aversions: You may start craving for certain foods or develop an aversion to certain foods that you previously liked. A heightened sense of smell: Your sense of smell heightens and even the mildest fragrances or smells can make you feel queasy. Bloating: The progesterone hormone relaxes the digestive tract and slows down the digestion process, causing bloating. Metallic taste: Change in the hormonal levels might make some women experience a metallic taste in the mouth. Having citrus juices or sour candy can help deal with this odd feeling. Frequent urination: Hormonal fluctuations are the reason for the increased urge to pee. Vaginal discharge: An increase in the vaginal discharge is quite common during this week and it helps prevent any bacterial infection of the uterus. Basal body temperature: There will be an increase in the basal body temperature, which can be known if you have been charting the temperature. A healthy pregnancy can be achieved with a healthy lifestyle and for that, you need to follow the right habits. Take folic acid and prenatal vitamin supplements every day. Eat a balanced diet that is rich in all the essential vitamins, minerals, and proteins. Do not indulge in strenuous activities that may put stress on your abdomen. Do exercises like swimming, walking, and yoga for 30 minutes a day. Avoid smoking, consumption of alcohol, and illicit drugs. Inform the doctor about any health issue or medications that you are presently taking. Next, read about the kind of foods you should include in the diet for a healthy pregnancy. Fruits: Ensure that you have all kinds of fresh fruit and juices that are a rich source of vitamins. Vegetables: Include dark green vegetables (a rich source of folic acid), beans, peas, starchy vegetables, and red and orange vegetables in your diet. Dairy: Add milk and milk products in your diet as they are a rich source of calcium. Protein: Have meat, egg, and pulses for sufficient protein intake. Omega 3 fatty acid: Seafood is a good source of omega 3 fatty acids. Fiber: Eat whole grains such as rice, wheat, oats, barley or grain products, including breakfast cereals, oatmeal, pasta, and brown bread that are rich in fiber. Folic acid: It prevents birth defects like spina bifida in the baby. You can get it from over-the-counter folate supplements, fortified cereals or from vegetables such as spinach, romaine lettuce, mustard greens, broccoli, kale, beans, and peas. Iron: Include lean meats such as beef, lamb, pork, chicken, fish, and iron-rich grain products such as bread, pasta, and cereals. The prenatal vitamin supplements also provide the essential amount of iron. Calcium: Milk products like yogurt and cheese, sesame, soya beans, green leafy vegetables and nuts among others should be consumed for adequate amounts of calcium that is required during pregnancy. If you aren’t sure about taking any specific foods, ask your doctor about it. While you may not know if you are pregnant in the third week, it helps to take care of yourself, especially if you have been trying to conceive. You can use your ovulation calendar or generally try to maintain a healthy lifestyle as mentioned above for yours and your baby’s safety. What symptoms did you notice in the third week of pregnancy? Share your experiences in the comment section below.